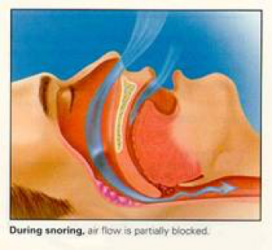 Snoring occurs when the airway or passage through which we breathe becomes partially blocked or occluded. An example would be your tongue that falls back as you drift off into deep sleep. As the diameter or size of the airway passage is shrinking, the net result is a muffled sound secondary to vibrations in the throat, or snoring. In many situations, this compromise is minor and the body continues to get adequate amounts of oxygen to cause little or no harm. However, this is a red flag as it could also be one of the early signs or a part of sleep apnea. 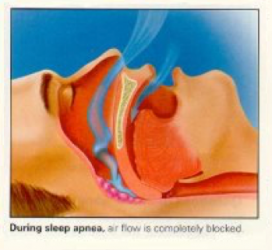 Most all sleep apnea sufferers snore in between bouts of apnea, or oxygen interruption. A sleep study should be done to determine the seriousness of one’s condition. Sleep apnea patients have a rough night and don’t even know it is happening. In a given night, these apneic events (when a patient stops breathing) can occur anywhere from 30 – 50 times, and in some people as many as 60 – 100 times per hour! Obviously, these individuals awake exhausted and spent each morning, as they’ve been fighting for oxygen all night. Sleep should be a replenishing award for each of us. … and the obvious one, chronic sleepiness. A simple test can be taken that will grade this last symptom called the Epworth Sleepiness Scale. View the Epworth Sleepiness Scale Questionnaire Additionally, a Sleep Observers Questionnaire should be filled out by anyone who regularly observes the potential sleep apneic. Not all apneics will score high, but if you do, it is a very good sign of OSA (obstructive sleep apnea). It can also cause learning or memory disabilities, as well as periods of nodding off while on the phone or at work. Obviously, sleep apnea patients are at a much greater risk of having auto accidents. People most likely to have or develop sleep apnea include those we’ve mentioned already who snore, or who are also overweight, or have high blood pressure. Another concern would be people who have some physical abnormality in the nose (deviated septums), throat, or other parts of the upper airway. Another easy marker is neck-size. A study of professional football players in the Super Bowl Study turned up astonishing results, as 34% of linemen in that game were diagnosed with sleep disordered breathing, which is roughly 8 times the average. A neck size of 17″ or larger is a good indicator of this disorder, and it doesn’t matter if it’s muscle or fat. Chances are that your spouse, other family members, or your coworkers, are keen to the problem. They either also suffer from your noisy snoring, or see the signs of a body which is not sleeping at night as it woefully attempts to navigate a given day. Recently, a condition known as “secondary snoring” has been researched, and has been shown to cost the bed partner of a snorer an average of 1.5 hours of sleep each night. Snoring, in fact, has also been shown to be a leading cause of divorce. Nocturnal signs and symptoms associated with OSA include drooling, dry mouth, sleep restlessness, witnessed apneas, choking or gasping and sweating. The Good News Is That Snoring & Sleep Apnea Are Treatable! In our office, we treat snoring and sleep apnea with a unique approach. The gold standard for treatment of sleep apnea is presently with the CPAP machine. However, only a minority of CPAP owners are still compliant after one year. If you are one of the non-compliant, we can fabricate an oral appliance that will help open your airway and reduce the severity of your sleep apnea. These appliances reduce sleep apnea associated health risks without the need for surgery, medications, or other therapies. A custom oral appliance worn while sleeping, they hold the lower jaw forward and open, preventing the tongue and throat tissues from collapsing the critical airway. There is a 96% success rate (snoring) for people treated with these appliances.